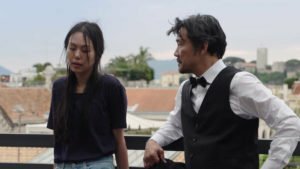 Once again, Hong Sang-soo crafted a piece that is succinctly his own, and it is sure to please Hongophiles everywhere. It’s mid-May now, which means only one thing: Cannes Film Festival is finally in full swing. While some are lucky enough to attend the prestigious festival, most are stuck at home reading recaps of each day. For the latter group, there is still hope: The Cinema Guild (strategically) expanded the U.S. distribution for Claire’s Camera, a film that captures the unique energy of the world’s most famous film event. 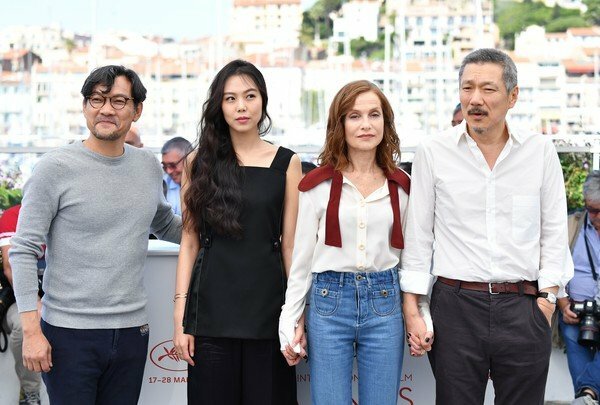 Director Hong Sang-soo has never been one to take a break from filmmaking, but with Claire’s Camera, he officially declared that he will never be one to take even a breather from it; his third film of 2017 (behind the miraculous On the Beach at Night Alone and the meditative The Day After) was shot during the 2016 Cannes Film Festival. It went on to premiere at the 2017 Cannes and, one year later, reach America. The film follows three characters. First, there is Jeon Man-hee — played by Hong’s muse and mistress Kim Min-hee, who is excellent as always — recently fired from her film sales position by Nam Yang-hye (Chang Mi-hee in her first Hong movie). She was fired for having an affair with Director So Wan-soo, who Yang-hye is secretly in love with. These three characters seem to have gone their separate ways by the beginning of the film, but then French music teacher Claire enters the scene. Claire (Isabelle Huppert) carries a polaroid around, snapping pictures of whatever she find beautiful. When Director So asks Claire why, she says that “you are no longer the same person” after you have a picture taken. The group is based in Cannes, Yang-hye and Man-hee selling Director So’s film. Claire, however, has no actual involvement in the festival. She is merely supporting a friend, spending her days lounging around cafes and parties. It is at one of these cafes that she meets Director So in one of the film’s funniest scenes. They sit at adjacent tables and begin small talk; when they eventually move to the same table, they sit in silence for what feels like minutes. Hong portrays Cannes as a place that is equal parts exciting and lonely. One spends just as much time at wine-and-cheese rooftop parties as one does wandering the streets at night. Claire and So connect out of a mutual loneliness rather than shared interests. They try to connect (Claire tells So he seems like an artist, only for So to say the same thing back), but the silence speaks volumes. Over time they become friendly, though. Through So, Claire meets Yang-hye. While conversing with So and Yang-hye, she learns that they know Man-hee, who Claire had just met off screen. What ensues is a circling, cat-and-mouse type of story where Claire is a cat attempting to herd the mice. The characters in this film differ from those of Hong’s usuals. Of course, there is a filmmaker in the story, but the three leading women are not the artist-types that the filmmaker favors. Two of them work on the business side of film and the third is a high school teacher — there have been plenty of professors in his catalogue, but not many school teachers. Nevertheless, this film does contain the usual Hongisms that his fanbase has come to expect: zooms, situational comedy, and lots of alcohol. By far the most interesting Hongism here is one that has dominated his 2017 lineup. 2017 was the year where the public learned of Hong Sang-soo’s affair with Kim Min-hee. In fact, it was at the very festival where Claire’s Camera premiered that he confirmed the rumor. With this knowledge, audiences realized that On the Beach at Night Alone, The Day After, and Claire’s Camera contain a sort of self-analysis of his affair. Beach and The Day After confront the guilt and repercussions of the affair directly, while Claire’s Camera takes a wider approach. Hong inserts himself rather cleverly into the piece: the opening shot contains the poster for his 2016 film Yourself and Yours with just the “soo” of Hong Sang-soo visible. Notice that Director So’s first name is Wan-soo, allowing the poster to be a film by So Wan-soo, not Hong Sang-soo. Whether intentionally or not — though with Hong I generally assume every inch of every frame is intentional — this bridges Directors So and Hong together. Therefore, the affair between Director So and Kim Min-hee’s character becomes ever-the-more self-reflective. Regardless of the real world significance of the film, Claire’s Camera is exactly what one wants from the Korean auteur. This is without a doubt his most beautiful film; the colors pop and the south of France vistas enchant. It’s also one of his most accessible, as the runtime is only 69 minutes. The iconic master shots and zooms feel as precise as always, and the writing is sharp. Oddly enough, the only real problem here is with some of the acting. Hong rarely missteps with actors, but the casting of Isabelle Huppert here was — and this truly kills me to say — wrong. The problems with her may have come because she wasn’t performing in her native tongue, though that didn’t stop her in Hong’s 2012 film In Another Country. The dialogue’s pacing dragged when she spoke, yet what she had to say was insightful and engaging. There is also a problematic implication by having Claire, the white European woman, swoop in and incite change with her every word. Having her be a foreigner is vital to the film, but having her be the God-like character of the film adds a trace of European supremacy. Despite its flaws, Claire’s Camera is an upper-tier Hong. It is lighthearted, funny, and memorable. It may not have the emotional punch of a film like Right Now, Wrong Then, but it still offers an impressive array of characters and themes. Considering this is one of three films the filmmaker released in one calendar year, I would say it is worth any Hong fans’ time.